Wex has slashed the cost of Canon's best APS-C format DSLR to date, the EOS 7D Mark II, to just £999. 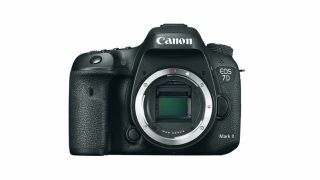 That’s a massive £350 price cut from yesterday – and the lowest we’ve ever seen the Canon EOS 7D Mark II on sale in the UK, making the semi-pro body an appealingly cheap DSLR camera for enthusiasts. This is one of the best Cyber Monday camera deals we’ve seen this morning. And it's a strong start to a day that’s going to be jam-packed with photography bargains. The Canon EOS 7D Mark II is an update to a classic. It boasts faster burst shooting, improved autofocus and much greater ISO range. The traditional optical viewfinder offers a 100% field of view, and is big and bright enough for eye-level image composition, even when working in dim lighting conditions. You also get a very capable 65-point AF system to provide pin-sharp focus no matter where your subject wanders in the frame. Battery life is respectable too, giving you around 670 shots per charge. This is Canon's best APS-C format model to date – and a great upgrade from the original EOS 7D. And now that it’s £250 cheaper than yesterday, there’s never been a better time to buy it.